This is officially known as the ‘Saturday Night Meat Beast’ – or the ‘I’m never goin’ to Pizza Hut ever again’. 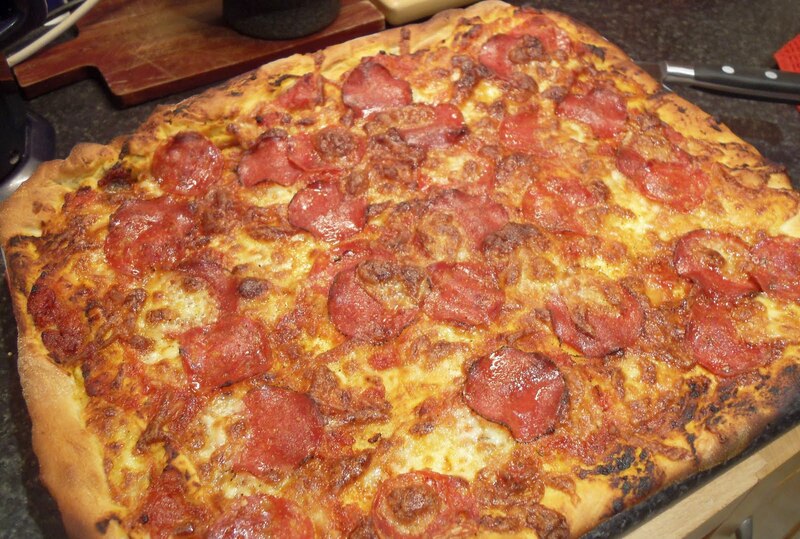 This is a blow out pizza, too much cheese, too much meat…just tooooo much….but it’s the King. Serves 4 normal people, 2 greedy buggers or 1 person with an eating disorder. 200 grams strong white bread flour, sifted. (has to be strong white bread flour – self raising won’t cut it. Get the sauce done first, wazz together in a food blender the garlic, tomato puree, Basil and olive oil making a paste. Drop this into a pan and cook out.. in fact let it split (the oil separates from the solids). Then add the carton of chopped tomatoes and reduce to a simmer for 20minutes. Remove from the heat and cool. Next for the Pizza base. Mix yeast with the luke warm water and give it a right good beating – you want froth. Mix the flour, salt and sugar together in a separate bowl then lash in the yeasty water. Get you hands in, bring everything together and form into a ball. Next drop it out onto a floured surface and start kneading. Pull, push, twist, stretch and generally treat the dough very badly – you need to literally kick the life out of it to get the gluten in the flour moving…..10minutes minimum. When its springy and smooth leave the dough in an oiled bowl, cling film and leave for a couple of hours (go to the pub). When you get back turn the dough out onto a floured work top, flatten and form into a what ever shape you fancy – I go for the square every time with this beast. Get the oven on to full tilt, flour a large flat baking tray (or Pizza stone) and stretch the dough over it. Spoon over the cooled sauce, scatter over the dry Mozzarella, then the meats and finally tear the Buffalo Mozzarella and scatter over everything. Now incinerate in the oven…..incinerate meaning COOK WELL…conventional ovens aren’t Pizza ovens so they need do a bit of over time to ensure the middle of your Pizza isn’t goopy!